Olive green shirt, pant, both from Pause. I love the ’80s for their opulence. I loved hip-hop and disco for what they stood for, as well as the ’90s for neon leggings, big T-shirts and shoulder pads. There was nothing ‘fashionable’ about these, but they were dreamy. The poodle blunt haircut on my mother was the funniest and most vivid thing that I’ll never forget! I bring my true self to everything. And I end up wearing what I feel. I love details and precision in my cuts so it hides my inner chaos sometimes. I feel feminine, mostly in beautiful drapes and powerful mostly in comfortable shoes. Casual chic; I can go from homeless to glam in no time. 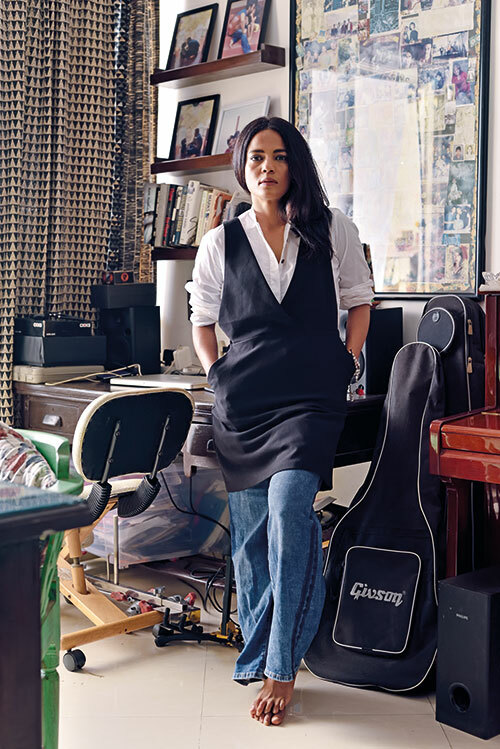 White shirt, by Nafisa Rachel William; black dress, from H&M; blue denims, from Lindex. Right now, I love jumpers; I’d do a power suit any day and I love wearing saris, but my go-to will always be either a jumper or a linen dress. I have never been inhibited. I grew up in Delhi and, as a sportsperson, I used to be in shorts most of the time. I always knew how to take care of myself. I built an intimidating persona to protect myself and my girls. But Mumbai liberated me, clothing-wise and curfew-wise. Clothes don’t make me who I am; I definitely do make the clothes. I have a good sense of what I like and what works for me. Copying trends is not my thing and whether that changes anyone’s perception of me or not, I wouldn’t be able to tell you.